Plum Honeychurch > Blog > Plum Honeychurch > All You Need to Know About Hiring Our Amazing Donut Walls. Do you want to create a talking point at your next big event? Then you have to get a Donut Wall and I know just where to get one… from me. What Donut Wall do you need? We now have two Donut Walls available for hire. Our classic Gold Framed Donut Wall which holds 55 freshly baked donuts and our new Union Jack Flag Donut Wall holding over 200 freshly baked, red, white and blue iced donuts. All our donuts are baked fresh from our local bakery, we also try to accommodate any special designs you may have for the donuts. All the donuts contain gluten, eggs and milk and are fried in the traditional style with a choice of toppings, Caramel, Chocolate and White Iced, we also have the classic Jam Donut. The Jam Donuts do not hang off the wall but can be placed on cake stands next to the wall. 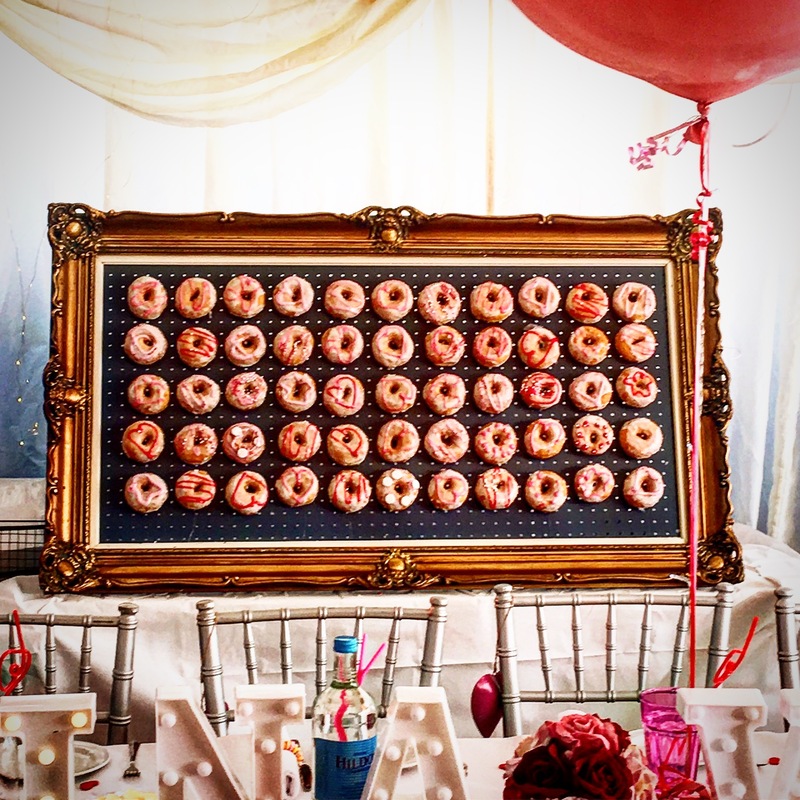 Our Gold Framed Donut Wall stands on a table and measures 140cm long by 80cm high holding 55 donuts at one time and can be restocked with more donuts as needed. We also supply paper bags for guests who want to take a donut away and napkins for sticky fingers. Our Union Jack Donut Wall is a free standing wall and measures 2m high by 1m wide. The Union Jack also makes an amazing back drop as a photo wall for your guests. 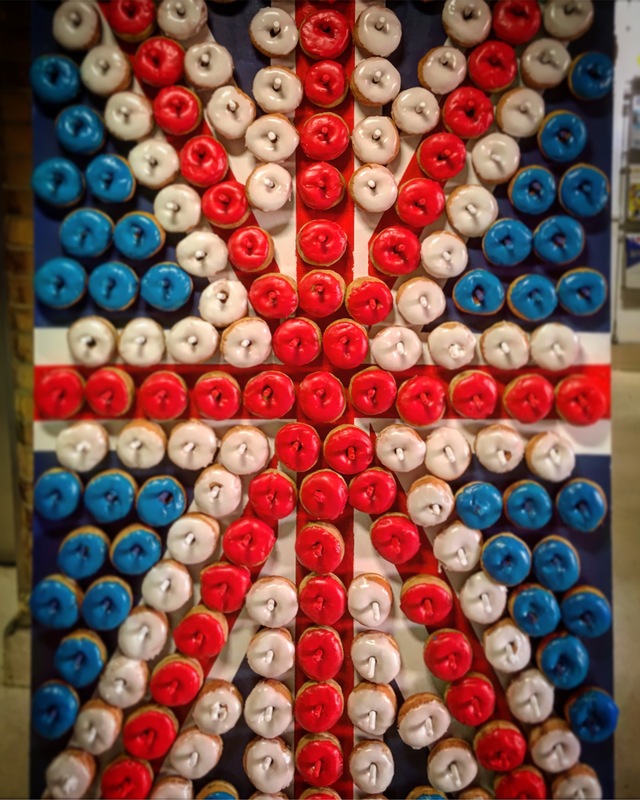 The Donut Wall holds over 200 freshly baked donuts which are iced in red, white and blue colours and displayed in the shape of the Union Jack Flag, the wall is also painted in the same colours so as the donuts disappear the wall remains as the flag behind. We can take commissions for Donut Walls, maybe you need a different flag or you would like the wall decorated with a certain design? Pop over an email to hello@plumhoneychurch.com and we can discuss things further. All our Donut Walls are delivered and constructed by ourselves and we will and collect the wall after the event or the next day. Prices start at £150 for the Gold Frame Wall and £500 for the Union Jack Wall with additional charges for travel.